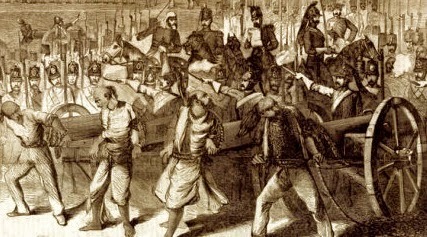 Mutineers tied to cannons in the same manner that Houdini was tied to a cannon. They were about to be executed. Dear Sir-We challenge you to stand in front of a loaded Government 8 cwt. steel gun, to which we will secure you, insert a fuse which will burn for twenty minutes, and if you fail to release yourself within that time you will be blown to Kingdom Come. In lashing you to the muzzle of the gun we will place a rifle barrel between your arms behind your back, bringing your hands on your breast where we will securely lash them. Your feet we will tie to an iron ring which we will nail into the floor. Your body we will lash against the muzzle of the gun in such a manner that we believe it will be impossible for you to free yourself. Signed by four petty officers of the Royal Navy. According to the book, The Original Houdini Scrapbook, by Walter Gibson, Houdini accepted the challenge and found it to be very difficult. In Houdini's own words, "The situation required quick action. I struggled and worked at my best. I lived up to my reputation, and free myself in twelve minutes!" There is a small wrinkle in the historical record however, according to the William Kalush biography, The Secret Life of Houdini, he says that the chief of police reluctantly allowed the demonstration to go forward and even allowed the cannon to be loaded, however, he did not allow them to light the fuse. But the story in the Walter Gibson book says that they did light the fuse. I don't have a newspaper account to refer to to find which story is correct. Fast forward to October 12, 1919, The Washington Times Newspaper reported that while Houdini was filming The Grim Game, he had accepted the challenge of four naval officers to be strapped to the mouth of a cannon in Pershing Square, Los Angeles. The Times reported, "The weapon was loaded and a fuse attached, but the police interfered before the trigger lanyard could be pulled." The newspaper further reported "Houdini extricated himself from the ropes, which it had taken six minutes to tie, in exactly two minutes and a half." I'm wondering if this is the cannon escape that Kalush was referencing but connected it to the Chaltham Cannon Escape. I have no problem believing that Houdini presented this escape two different times. He often repeated challenges in different cities. But the best proof would be newspaper accounts and so far I only have the one from The Washington Times. Eventually, I hope to find one from an L.A. paper. I did some checking and discovered that Pershing Square during World Ward 1 was often the scene of militia receptions and was named after General Pershing, so it seems highly likely that there were cannons present for Houdini to actually do this escape. The upcoming HOUDINI-Miniseries will feature Adrien Brody escaping from the mouth of a cannon. I saw a still image, and it looks like an older Houdini, so my guess it was 1919 Cannon escape. Finally, Steve Baker, who was known as Mr. 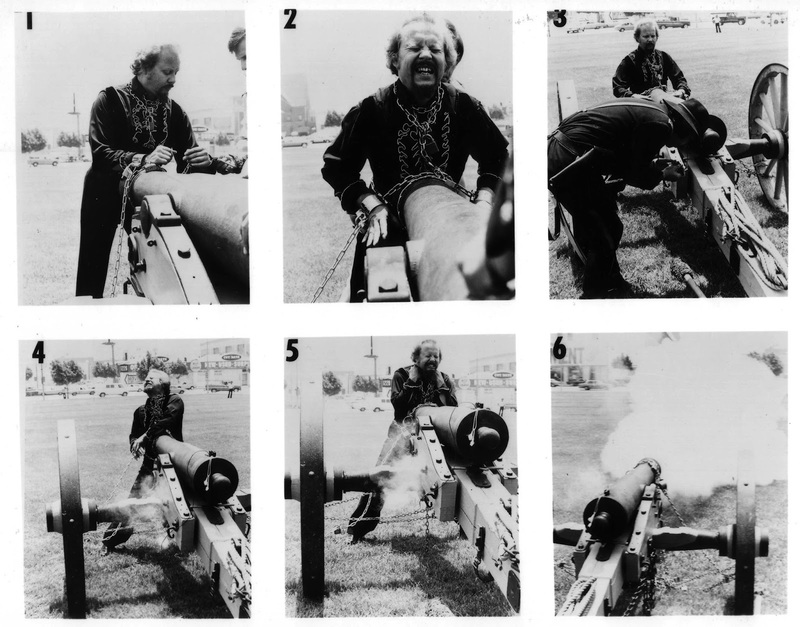 Escape during his performing career, presented a Cannon Escape as well in the early 1970s. His version was called 'The Human Target and a photo collage can be seen below. Steve's version had no cannonball, but did include gunpowder and the fuse. This was during a period of time when Steve was trying to duplicate all of Houdini's escapes. It would be great to find another reference for 1919. Keep up the great work. Thanks Joe, I appreciate your comments. I don't have the British Tours book, so I'm glad you added that info!